Lord Dalhousie was Governor of Nova Scotia. He was deeply interested in agriculture and was convinced that settlements should be established in the forested interior of the province. He persuaded William Ross, a native of County Cork in Ireland, and a lieutenant in the 16th Regiment of Infantry, to accept a captaincy in the Nova Scotia Fencibles, and to undertake the settlement of the remnants of the latter regiment on the lands of Sherbrooke (later called New Ross). In August, 1816, Captain Ross, his wife Mary and four children, and 172 disbanded soldiers established this settlement for his men. He built a small log house overlooking Lake Lawson, and the following year, with axe and whip saw, he built the frame house which still stands. He named his new home Rosebank. one axe, one hoe, and one whip saw for every man, one hand saw, chisel, draw knife and auger for every five men, and a fair proportion of nails, hammers, gimlets and spades for all. seed potatoes, turnip seed, red and white clover seed, shovels, garden rakes, Dutch bake ovens, fishing nets, rope, lead, cork, trout hooks, twine, wax and thread. 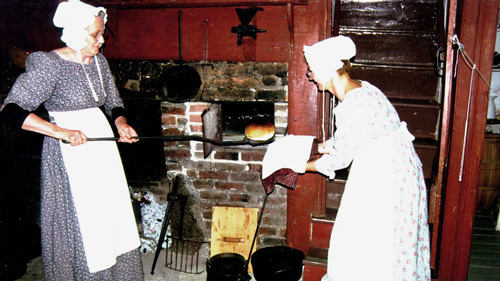 Rations for the first settlers were discontinued in 1818, and for later comers in 1820. By this time many of the people had abandoned their lands and left the district, but those who remained became firmly established on the land. Captain Ross did not live long to enjoy the fruits of his labor. In the fall of 1821, he attempted to blaze a route for a proposed road to Halifax. He was overtaken by a severe storm, became gravely ill, and died in Halifax on May 2, 1822. Mary Ross was left with six young children to face life in a raw pioneer settlement. The problems she and her family faced were similar to those experienced by many throughout the rural areas of Nova Scotia, but while most of these have disappeared forever in the mists of time, the day to day life of the Ross family was faithfully recorded in the journals of the 2nd son Edward J. Ross. In 1835, William Ross, the eldest son, was married and lived across the lake. He was responsible for the operation of a saw and grist mill, but he helped out on the farm when required and the other boys helped him in the mill at peak periods. After 1850, William left home and settled in Cornwallis. The second son, Edward, helped George on the farm, did William’s bookkeeping for the mill, and operated a small store with supplies he brought in from Halifax. He also bought cattle, butter, hay, barrels and other produce of the district and sold it in Chester, Lunenburg and Halifax. Edward attended King’s College School in Windsor, he became Justice of the Peace in 1838, collected county rates, paid pensioners, and controlled statute labor. After 1850, Edward left New Ross and set up an important business in Boston. He later returned to Nova Scotia and served as Justice of the Peace in Kentville until his death in New Ross in 1894. The third son George, was primarily responsible for the farm operations. However, in stormy weather and during slack times, George served as the community shoemaker, having learned his trade from Jacob Hiltz of the nearby Forties Settlement. George was also educated at the King’s College School, and in later years was Captain of Militia, Justice of the Peace, and a leader in the community. Lawson, the fourth son, worked at home until 1837, but then left for St. Martin’s in New Brunswick. After several years there, he went on to Boston where he remained until he died. The youngest son, James, helped his brothers on the farm, and Mary, the eldest child, married Andrew Kiens, a son of John Kiens, the former Quartermaster of the 5th Battalion, 16th Regiment, and she went on to live on the Kiens farm across Lake Lawson. George Ross had 12 children, Harold Ross fought in the 1885 Rebellion with the North West Mounted Police and remained in Saskatchewan. Harvie married Eva Ross of Kentville, and Ralph married and settled in British Columbia. Ethel married the Rev. Charles White of Shelburne, and Ellen married a Rev. Smith. Emily married Dr. Mark Rogers from the Boston area, and they lived in Baltimore, Maryland. Rosebank Farm was passed from George to Albert Ross in 1895 and from him to his sister Lizzie, in 1950. Neither Albert nor Lizzie married, and when Lizzie died the property was passed on to their nephew, Mark White. Mark White died in 1963, and in 1970 the property was transferred to the Province of Nova Scotia through the New Ross District Museum Society and the Nova Scotia Museum by his widow, Mrs. Mark White.